The Different Arabic Versions of the Qur'an - Are all Qur'ans the same? Many Muslims have told me that the Qur'an has been perfectly preserved and that all Qur'ans around the world are absolutely identical. They have said this in order to prove that the Qur'an is superior to the Bible. Maybe a Muslim has said this to you? Maybe you are a Muslim and this is what you believe and have said about the Qur'an yourself? It is common for Muslims to believe and say this because this is what their leaders teach them. Consider the following quote. The above claim is that all Qur'ans around the world are identical and that "no variation of text can be found". In fact the author issues a challenge saying, "You can check this for yourself by listening to the recitation of Muslims from different parts of the world". In this article I will take up this challenge and see if all Qur'ans are identical. Some history related to the recitation of the Qur'an. A Comparison between two Arabic Qur'ans from different parts of the world. The extent to which the differences affect the meaning. Appendix 2 - How do Islamic scholars understand the different versions? Appendix 6 - Where to buy different versions of the Qur'an. To start our investigation we turn to an Islamic encyclopedia written by a practising Muslim. This scholar explains an important aspect of the history of the Qur'an. Please read this quote a few times if you are new to this area of study. Therefore, we need to realise that the Qur'an has been passed down to us from men called the "Readers". They were famous reciters of the Qur'an in the early centuries of Islam. The way these men recited the Qur'an was formally recorded in textual form by other men called the "Transmitters". There are in fact more Readers and Transmitters than those listed above. The table below lists the ten commonly accepted Readers, their transmitted versions, and their current area of use. Abu Ammaar Yasir Qadhi, An Introduction to the Sciences of the Qur'aan, p. 199. What the above means is that the Qur'an has come to us through many transmitted versions. You cannot recite or read the Qur'an except through one of these versions. Each version has its own chain of narrators (isnad) like a hadith. There are more versions than those listed above but they are not considered authentic because their chain of narration is considered weak. Not all of these versions are printed or used today, but several are. We will now compare two of them. All these facts can be a bit confusing when you first read them. If you are feeling that way don't worry; it's normal. To make things simple we will now compare two Qur'ans from different parts of the world to see if they are identical. The Qur'an on the left is now the most commonly used Qur'an. It is the 1924 Egyptian standard edition based on the of the transmitted version of Imam Hafs. The Qur'an on the right is according to Imam Warsh's transmitted version and is mainly used in North Africa. When we compare these Qur'ans it becomes obvious they are not identical. There are four main types of differences between them. The following examples are from the same word in the same verse. On some occasions the verse number differs because the two Qur'ans number their verses differently. There is a slight difference in script as well: the letter Qaaf in the Warsh version is written with only one dot above, and the Faa has a single dot below. This is the orthography of North African (Maghribi) Arabic script. The Hafs version is a 2nd form verb, while the Warsh version has an extra alif to make a 4th form verb. This intensifies the meaning of the verb. The Hafs version has the extra word waw (and). This does not change the meaning of the verse but does add an extra word. The two words are recited differently but have the same meaning. They are two different examples of the 8th form jussive verb. This is most likely a difference in dialect. In the Hafs version qaala is the perfect tense and therefore Muhammad is the subject of the verb, but in the Warsh version qul is the imperative and therefore the subject is God who is commanding Muhammad/Muslims. This difference is repeated in 21:112. There are different letters at the beginning of these words. This changes the connection from "and" to "therefore". Arabic uses dots (i'jam) to distinguish certain letters that are written the same way. For instance the basic symbol represents five different letters in Arabic depending upon where the diacritical dots are placed: baa', taa', thaa', nuun, yaa'. Here we see another difference between these two Qur'ans; they do not have the dots in the same place. The result is that different letters are formed. There are different letters at the beginning of these words. This difference changes the meaning from "we" to "he". There are different letters at the beginning of these words. This difference changes the meaning from "you" to "they". There are different root letters in these words and this makes two different words. The two words have a similar meaning but are not identical. There are different letters in the middle of these words. This difference changes the meaning from "I" to "we". Arabic uses small symbols (tashkil) above and below the letters to indicate some of the vowels of a word. Here we see another difference between these two Qur'ans; they do not use the same vowels in the same place. The Hafs version has a long alif which makes an active participle meaning owner, while the Warsh version is a nominal noun meaning king. There are different vowels on the first and second letters of these words. The Hafs version is a 1st form of the verb, while the Warsh version is a 3rd form. There is a different vowel on the last letter. The fatha vowel used in the Hafs version places the verb into the subjunctive mood which gives the preceding particle hatta the meaning so that. The Warsh version uses the damma vowel which places the verb into the imperfect indicative mood which gives the particle hatta the meaning until. There are several different vowels in these words. These change the noun from singular to plural; and hence changes the number of men you are required to feed to redeem yourself for failing to fast. And many a prophet was killed (qutila) ... 3.146. There are different vowels in these words. These change the meaning from the active to the passive. Compare to the use of this word in 3:144. There are different vowels on the last two letters of these words. These change the case and pronunciation of the word. The Hafs version is in the accusative case while the Warsh is in the genitive. This reflects a different understanding of the grammar of the sentence. There are different vowels on the first two letters of these words. These change the word from an active participle in the Hafs version to a noun in the Warsh. We have now considered three types of differences between these two Qur'ans: differences in letters, diacritical dots and vowels, but how many of these differences are there between these two Qur'ans? There are Islamic reference books that answer this question. The title page below is from a book entitled, "The Readings and Rhythm of the Uthman (Qur'anic) Manuscript". In this book the author displays the text of the Hafs version of the Qur'an but underlines any word where there is a difference among the Readers. This difference is then shown in the margin. The author has used a colour coded system to show which Reader is different. If the variant word in the margin is red this indicates that the Reader was Imam Warsh. Please study the page below and identify the underlined words and then the corresponding colour coded words in the margin. When the red coded differences are counted there are found to be 1354 accepted differences between the Hafs and Warsh versions. There is another type of difference between these two Qur'ans, the Basmalah. The Basmalah is the phrase, "In the Name of Allaah, the Ever-Merciful, the Bestower of Mercy". 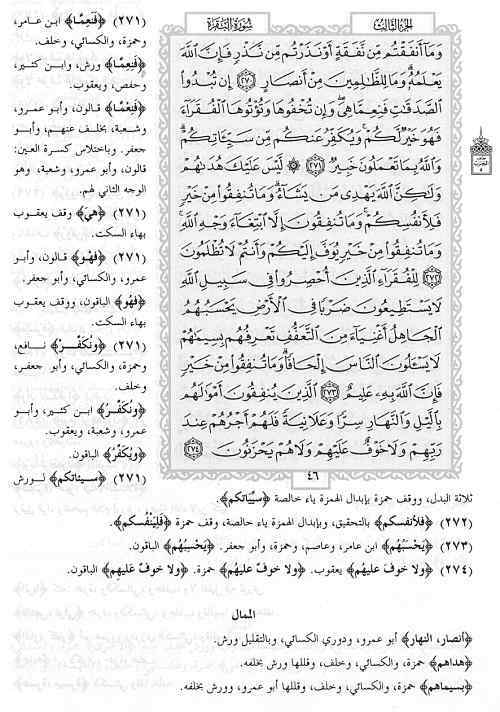 Both the Hafs and Warsh versions of the Qur'an have the Basmalah at the start of every sura except sura 9. In this way they are identical, however, while including it in their Qur'ans these Imams understood the Basmalah in very different ways. For Imam Hafs, the Basmalah was part of the revelation and part of the first verse as it was recited, while for Imam Warsh, the Basmalah was a du'a (supplication) to introduce each sura; it was written at the start of each sura, like the sura titles, but was not considered part of the revelation. Abu Ammaar Yasir Qadhi explains this. (In the Name of Allaah, the Ever-Merciful, the Bestower of Mercy). There is a difference of opinion amongst the scholars of the Qur'aan over whether this phrase is to be considered as a verse at the beginning of each soorah, in particular Soorah al-Faatihah, or whether this is merely a phrase said for blessings between the soorahs, and is meant to identify where one soorah ends and the next begins. To summarize the above. The four Imams who founded the Hanafi, Maliki, Shafi'i and Hanbali schools disagree as to whether the Basmalah is part of the revelation at the start of each sura. Imam ash-Shafi'ee and Imam Ahmad believed that it was, while Imam Maalik and Aboo Haneefah believed it was not. As a result the different Readers who come from these schools have different views too. For Ibn Kathir, al-Kisa'i, and Abu Bakr `Asim (Hafs) the Basmalah was part of the revelation of each sura, but for the majority of the Readers: Nafi` (Warsh), Abu `Amr al-'Ala', Ibn `Amir, Hamzah, Abu Ja`far, Ya`qub al-Hashimi, and Khalaf al-Bazzar, the Basmalah was not part of the revelation. Therefore, while both of the Qur'ans we are examining contain the Basmalah, in the Hafs Qur'an it is considered part of the revelation, while in the Warsh Qur'an it is not considered part of the revelation but du'a. This is a significant difference because the Basmalah appears 113 times at the start of the surahs and has 4 words, which means there are 452 extra words in the Qur�an according to Imam Hafs than the Qur�an of according to Imam Warsh. I am often told by Muslims that the differences between these Qur'ans are only a matter of dialect, accent or pronunciation, and do not affect the meaning, however, this is clearly not the case. The examples given earlier show that the differences are far more significant: they change the subject of the sentence, whether the verb is active or passive, singular or plural, how the grammar of the sentence is to be understood, and whether or not the Basmalah is even part of the revelation at the start of each sura. These differences do affect the meaning. The evidence speaks for itself. Subhii al-Saalih summarizes the differences into seven categories. Differences in grammatical indicator (i`raab). Differences in nouns as to whether they are singular, dual, plural, masculine or feminine. Differences in which there is a substitution of one word for another. Differences due to reversal of word order in expressions where the reversal is meaningful in the Arabic language in general or in the structure of the expression in particular. Differences due to some small addition or deletion in accordance with the custom of the Arabs. Differences due to dialectical peculiarities. We can also add to this list the difference in the status of the Basmalah. Therefore, the claim that these differences are just a matter of dialect and do not affect the meaning is false. The evidence speaks for itself. Our investigation so far has only considered two versions of the Qur'an, but as we saw at the beginning of this article there are many other versions that could also be examined for variants. The book below does this. It is a Qur'an that lists the variants from the Ten Accepted Readers. 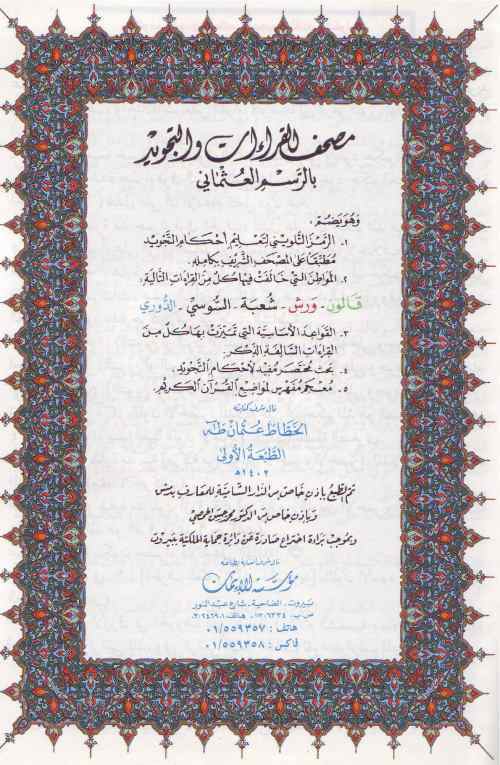 In this edition of the Qur'an, Muhammad Fahd Khaaruun has collected accepted variant readings from among the Ten Accepted Readers and included them in the margin of the 1924 Egyptian standard edition of the Hafs version of the Qur'an. These are not all the variants, there are other variants that could have been included, but the author has limited himself to the variants of the Ten Accepted Readers. As the title of his book suggests this makes it easy to know what the variant readings are because they are clearly listed. 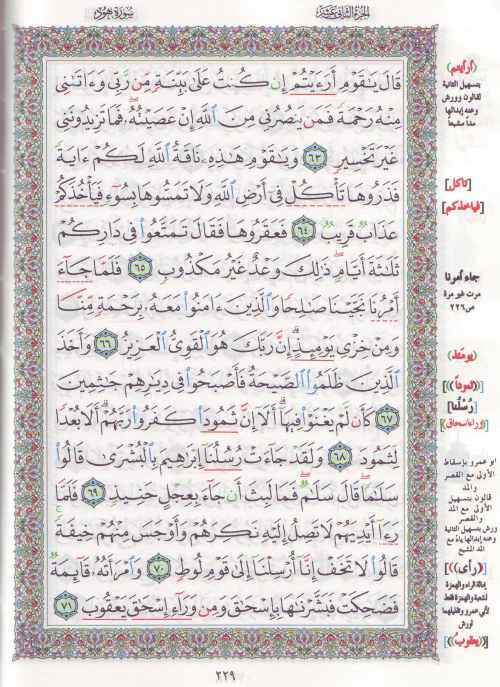 Below is a page from this reference Qur'an. You can see the variant readings listed in the margin. Approximately two thirds of the verses of the have some type of accepted variant. This is approximately 4000 accepted variants. Below is a six volume encyclopedia set which records all known variants. 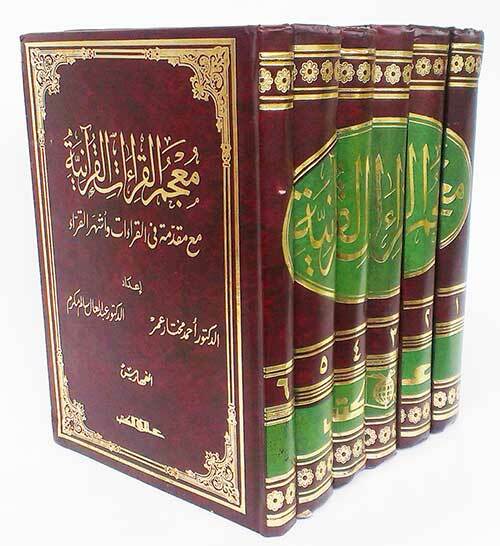 It is entitled: Mu'jam al-qiraa'aat al-Quraaneeyah, ma'a maqaddimah fee qiraa'aat wa ashhar al-qurraa (The Encyclopedia of the Quranic Readings with an Introduction to Readings and Famous Readers). Here is a sample page from this encyclopedia set. Almost every verse in the Qur'an has several variants associated with it. This claim is wrong. All of the Islamic evidence shows there are different canonical versions of the Qur'an used around the world today. They differ in their basic letters, diacritical dots, vowels, and the Basmalah; and these change the meaning of words and sentences. Therefore how the Qur'an is recited around the world today is different; not all Qur'ans are identical. I realise this may be hard for some Muslims to accept because in their culture they have grown up being taught there is only one Qur'an, however, this is the fault of Islamic leaders who continue to exaggerate about the Qur'an as they attack the Bible. This article only considers the different Arabic versions of the Qur'an used in the world today. If you wish to learn about the different Qur'ans in Islam's early history then read The Preservation of the Qur'an. Why are there so many different versions of the Qur'an? The traditional Islamic answer comes from a hadith in which Muhammad said Allah gave the Qur'an in seven modes (ahruf). Differences in Arabic grammar, i.e. sentence construction. If this hadith is authentic we can at least say that Muhammad allowed differences in how the Qur'an was recited. If the hadith is fabricated it still indicates a situation where different versions of the Qur'an existed and needed to have their existence justified. Either way, both options indicate that early in Islam's history there were different versions of the Qur'an. So how did the seven ahruf become the ten qira'at of Uthman's Qur'an? 1. Muhammad allowed the seven ahruf of the Qur'an. Each ahruf was a way of reciting the Qur'an, that is, each ahruf had its own qira'ah/reading. 2. These differences caused problems for the early Muslims. 3. Caliph Uthman solved this problem by establishing one text, in one dialect, and destroying the other versions. His goal was to remove the differences and unite the Muslim community around a single text recited in the Qurayshi dialect. 4. Uthman's Qur'an removed most of the differences between the qira'at/readings of the seven ahruf, however, some were able to remain due to the vague nature of the Arabic script that was used at this time. This vague nature of the script of Uthman's Qur'an allowed sections of the qira'at/readings from the other ahruf to be transferred into Uthman's Qur'an. If the readings/qira'at of the other ahruf was compatible with Uthman's basic text, it could continued to be read in Uthman's Qur'an. In this case the basic script was vocalised with different diacritical and vowel markings. This resulted in different readings/qira'at/vocalisations for the same word in Uthman's Qur'an. Thus Uthman's Qur'an was no longer a single reading/qira'ah but a mixture of readings from different ahruf. 5. 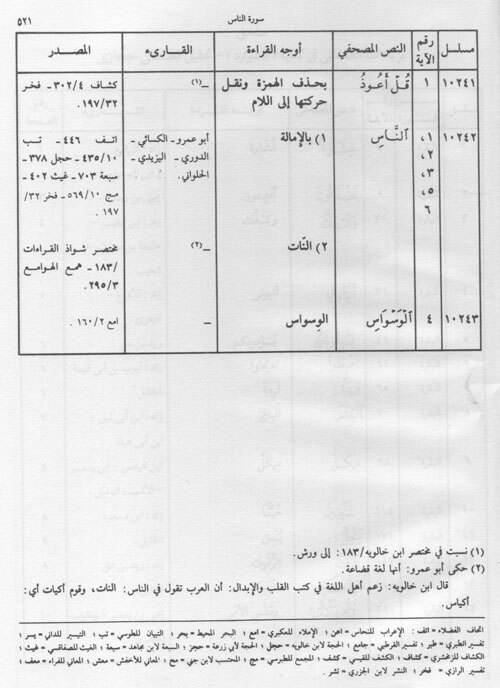 This vague nature of the Arabic text also allowed new variants to arise that were compatible with Uthmanic text. That God dissolves obligations with the pagans and the apostle. In fact Islamic scholars record at least 50 different readings/qira'at/vocalisations systems that had developed for Uthman's Qur'an. 6. Ahmad ibn Musa ibn Mujahid solved this problem by choosing seven of these qira'at/reading systems as canonical, and in time another three were accepted. Reciting any of the non-canonical qira'at was now forbidden and punishable. APPENDIX 2 - HOW DO ISLAMIC SCHOLARS UNDERSTAND THE DIFFERENT QIRA'AT? In this article we have considered the Ten Accepted Readers and looked at two of them in particular, however, there are many others. Islamic scholars record up to 50 different versions. No one accepts all of these as authentic. They are judged in the same way a hadith is judged for authenticity. In this way the Qur'an is the same as the Hadith. Most Islamic scholars believe that all of the authentic versions are from God. Some Islamic scholars believe there is only one recitation of the Qur'an and that the different qira'at/versions come from the Readers and not God. I should pause here to note that certain religious authorities have supposed that the Seven Readings were transmitted by a process of continuous transmission (tawaatur) on a wide scale from the Prophet himself, unto whom, so they allege, they were revealed by Gabriel. These authorities therefore consider that whoever rejects any of the established readings is an unbeliever. They have not, however, been able to produce any evidence for what they claim except that the tradition which reads, "The Koran was revealed in seven dialects (ahruf)". The truth of the matter is that the seven Readings had nothing to do with the Revelation, nothing in the least; and whoever rejects any of them is not for having done so an unbeliever; nor has he sinned or gone astray in his religion. The origin of these Readings is to be found in the diversity of tribal dialects among the early Muslim Arabs, and everyone has the right to dispute them, and to accept and reject them, or parts of them, as seems proper. As we have seen in Appendix 2 that the orthodox Islamic understanding regarding the different qira'at/readings is that all of the authentic qira'at are from God. Thus all of the Hafs qira'ah is a true revelation just as all of the Warsh qira'ah is a true revelation. Now scholars can say these things but what they do reveals what they truly believe. This is the case for Abdullah Yusuf Ali who made one of the most famous and widely used English translations of the Qur'an. Yusuf Ali based his translation on the Hafs qira'ah, however, he consulted other qira'at, and sometimes used a different qira'ah at certain points in his translation. That is, he chose from among the qira'at the reading that made the best sense. 2666. ... But more than one Commentator understands the meaning in the imperative, and I agree with them. This difference has an enormous affect on the meaning: Should Muslims consider Muhammad their father or not? In this case Yusuf Ali seems to accept both readings as valid but chooses not to include Ubayy ibn Ka'ab's reading as part of his translation. The Islamic scholar, Alan Jones, like Yusuf Ali, explains how he has selected the best reading for his translation of the Qur'an. What the above examples demonstrate is that Islamic scholars do not treat all of the qira'at/readings as equally valid but instead choose the best reading from among them. Christians do not have a problem with Islamic scholars doing this because this is something Christian scholars do with the Bible. But Christians do have a problem when Muslims claim that all the qira'at/readings are revelation when clearly Islamic scholars do not treat them this way. It is ridiculous to believe that God gave the Qur'an with thousands of variants; and it is quite reasonable for Islamic scholars to choose the best reading from among them. The doctrines of the seven ahruf and the ten authentic qira'at are simply an attempt to harmonize and justify the many variants. There may be some limited historical basis for these doctrines but in practice they do not work and Islamic scholars choose the best reading. In practice, Islamic scholars treat the different qira'at/readings as the first stage of interpreting the basic arabic text of the Qur'an. As we saw in appendix 2, the orthodox Muslim belief is that each of the ten accepted qira'at, as a whole, can be traced perfectly back to Muhammad. The isnad is the list of names of those who passed this qira'at on from Muhammad. Thus the claim is that the whole of the Hafs qira'ah, in this form, can be traced back to Muhammad. However the relationship between the seven ahruf and ten accepted qira'at of Uthman's Qu'ran makes the authenticity of these isnads problematic. If we assume that the hadith about the seven ahruf is authentic, then we can conclude that it would be possible for a qira'ah/reading of a ahruf to be passed on as a complete whole, and for this to be traced back via an isnad to Muhammad. However, the ten accepted qira'at of Uthman's Qur'an are not the same as the qira'ah of a individual ahruf. As we saw earlier, Uthman destroyed most of the differences between the ahruf, and only those readings/qira'at that were compatible with his basic text were able to remain, and be included, as a reading/qira'ah of his text. This means that the ten accepted readings/qira'at based on Uthman's Qur'an are a mixture of qira'at/readings from various ahruf and not a continuous whole reading/qira'ah going back to Muhammad. The only continuous whole readings that exist are going back to the establishment of the Uthmanic text. Therefore, the isnads for the Ten Accepted Readers which claim to go back to Muhammad as a whole are false. The Qur'an is famous for being memorised. Some Muslims have told me that it doesn't matter if there are differences between written Qur'ans because the Qur'an is firstly oral and only secondarily written. However, the differences between these written Qur'ans do matter because these written versions are the exact records of the oral recitation of the 10 famous Readers. That is, the written versions are the memorised oral versions. Thus the differences between the written versions are the differences between the memorised oral versions. I have bought some of these Qur'ans from my local Islamic bookshop. Any Islamic bookshop should be able to order them for you. They are also available online and from the following suppliers. The Warsh Version of the Qur'an online. Subhii al-Saalih, Muhaahith fii `Ulum al-Qur'aan, Beirut: Daar al-`Ilm li al-Malaayiin, 1967, pp. 109ff. Al-Nadim, The Fihrist of al-Nadim - A Tenth Century survey of Muslim Culture, New York: Columbia University Press, 1970, pp. 63-71. Also, Ibn al-JazarT, Nashr, vol. 1, pp. 34�7, cited from, Intisar A. Rabb, "Non-Canonical Readings of the Qur'an: Recognitition and Authenticity (the Himsi Reading)", Journal of Qur'anic Studies, 2006, vol. 8, no. 2, p. 124 footnote 114. 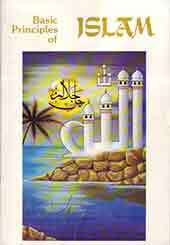 S. V. Mir Ahmed Ali, The Holy Qur'an: Text, Translation and Commentary, New York: Tahrike Tarsile Qur'an, 1988. Basic Principles of Islam, (no author listed) Abu Dhabi, UAE: The Zayed Bin Sultan Al Nahayan Charitable & Humanitarian Foundation, 1996. Adrian Brockett, `The Value of the Hafs and Warsh transmissions for the Textual History of the Qur'an', Approaches to the History of the Interpretation of the Qur'an, ed. Andrew Rippin; Oxford: Clarendon Press, 1988, pp. 33-45. Ahmad von Denffer, Ulum Al-Qur'an, UK: The Islamic Foundation, 1994. Cyril Glassé, The Concise Encyclopedia of Islam, San Francisco: Harper & Row, 1989. Grammatical errors in the Hafs transmission of the Qur'an. Alan Jones, Arabic Through the Qur'an, Cambridge: The Islamic Text Society, 2005. ________, The Qur'an - Translated into English, U.K.: Gibb Memorial Trust, 2007. Christopher Melchert, "Ibn Mujahid and the Establishment of the Seven Qur'anic Readings", Studia Islamica, 2000, no. 91 , pp. 5-22. _______________, "The Relation of the Ten Readings to One Another", Journal of Qur'anic Studies, 2008, no. 10, pp. 73-87. Abd al-'Aal Saalim Makram (wa) Ahmad Mukhtaar `Umar (I'daad): Mu'jam al-qiraa'aat al-Quraaneeyah, ma'a maqaddimah fee qiraa'aat wa ashhar al-qurraa', vols. 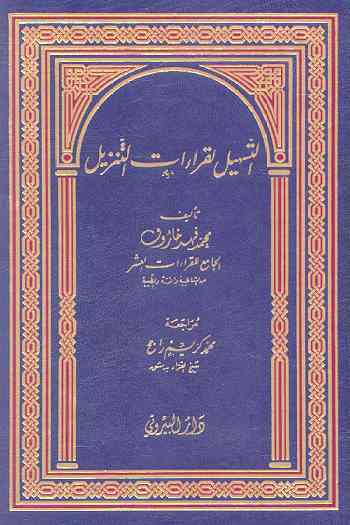 1-8, al-Kuwayt: Dhaat as-Salaasil, 1st edition 1402-1405/1982-1985. Al-Nadim, The Fihrist of al-Nadim - A Tenth Century survey of Muslim Culture, New York: Columbia University Press, 1970. Subhii al-Saalih, Muhaahith fii `Ulum al-Qur'aan, Beirut: Daar al-`Ilm li al-Malaayiin, 1967. Labib as-Said, The Recited Koran: A History of the First Recorded Version, translated by B. Weis, M. Rauf and M. Berger, Princeton, New Jersey: The Darwin Press, 1975. Abu Ammaar Yasir Qadhi, An Introduction to the Sciences of the Qur'aan, United Kingdom: Al-Hidaayah, 1999. The author welcomes your response via email. Further articles by Samuel Green. Copyright © Samuel Green 2005. Last updated 7th March 2016.